The Northmont Band program is excited to host its third annual Winter Guard, Percussion, and Winds competition on Sunday, February 3 at the Northmont High School Thunderdome. CLAYTON — The Northmont Band program is excited to host its third annual Winter Guard, Percussion, and Winds competition with the Mid East Performance Association (MEPA) on Sunday, February 3 at the Northmont High School Thunderdome. Percussion and winds performances will begin at 9 a.m., with an awards ceremony at 11:59 a.m. Winter Guard performances will begin at 12:34 p.m., with an awards ceremony at 4:07 p.m.
Northmont will have four groups competing this winter season. The Northmont Indoor Percussion will debut their show “Peace by Piece” in their first year of competition. Led by Director Dan Moell, and assisted by Josh Cyr, Abby Almanrode, and Jordan Kracus, the group has 21 members this year and will be performing a variety of music from the classical and baroque eras including “Bach Cello Suite No. 1 Prelude,” “Ave Maria,” “Toccata and Fugue,” among others. The Wee Bolt Winter Guard is directed by Patty Staley, assisted by Jessica Pasquale, Brandy Norman, Erin Abbott, Alexis Shepherd, and Dariona Taylor. The 27 member guard will be performing their show “Club Mash” to a remix of “Monster Mash.” The Wee Bolt’s took 4th place last year at MEPA Championships. The Northmont Intermediate Color Guard is directed by Gina Roberts, assisted by Samantha George, Morgan Roberts, Cody Matson, and Cassidy Smith. The 17 member guard will be performing their show “Trolls” to “Troll” by Shane Koyczan. The NICG took 1st place last year at MEPA Championships. The Mid East Performance Association (MEPA) is Ohio’s premier winter performance venue for winter guards and percussion ensembles throughout Ohio. With more than 100 member and guest units competing each weekend between the months of January and March, MEPA will have an impact on more than 2,000 performers and 8,000 spectators. Above everything, MEPA is first an organization dedicated to the positive growth of young performers. While these performers have various motives for joining one of its member units, MEPA believes that all competitions should serve as a vehicle to allow for growth in not just young performers but also unit directors, designers, judges, parents, and audience members. Northmont has had a strong presence and storied history in MEPA that dates back generations. Winning multiple championships, medals, and awards over the years and always entertaining the crowds. Come out and cheer on our Thunderbolt Percussion & Winter Guards. 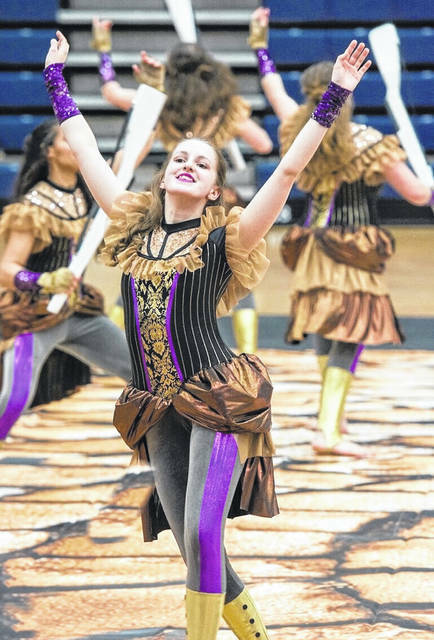 Northmont Indoor Percussion performs at 9:32 a.m. Northmont Wee Bolt Winter Guard performs at 12:34 p.m., Northmont Intermediate Color Guard performs at 1:02 p.m., and Northmont High School Winter Guard performs at 2:51 p.m. Ticket prices: Ages 6 and under get in free, students are $8, adults are $9, and seniors age 62 and up are $7.